All the facts, figures, tables, formulae, calculations and safety regulations that the working or student upholsterer needs to know – or make use of – contained in one handy-sized book by master upholsterer David James, who teaches upholstery at the university level. The Upholsterer's Pocket Reference Book includes: the workshop; equipment; safety; tools; machines; fixings; fittings; chair frame materials; construction and design; webbings; fillings; foams; suspension; machine sewing; stiches and seams; needles and threads; twines and cords; knots; lashing; whipping; fabrics; leather; cushions; trimming; tassels; tufts; pleating; piping; buttoning; fluting; cover cutting; measuring; and estimating. 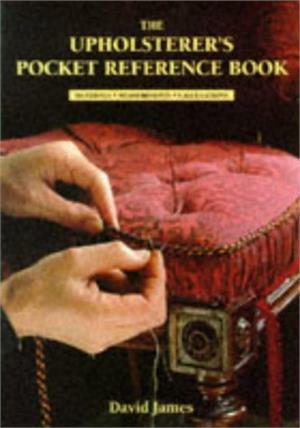 David James is an English upholstery expert and a highly published author. He began his career in the furniture industry in 1954 and after 12 years joined Buckinghamshire New University, then called the High Wycombe College of Technology and Art, as a lecturer. In 1981, he was promoted to senior lecturer, continuing in that role for a further 19 years before retiring in 2000. His recent work as an upholstery consultant includes wall coverings and projects involving the restoration of historic upholstery.